We’d love your help. Let us know what’s wrong with this preview of A Perfect Obsession by Heather Graham. Kieran Finnegan, forensic psychologist and part owner of Finnegan's, her family's pub, is consulting on the case. Craig and Kieran are a couple who've worked together on more than one Someone is murdering beautiful young women in the New York area and displaying them in mausoleums and underground tombs. The FBI is handling the case, with Special Agent Craig Frasier as lead. To ask other readers questions about A Perfect Obsession, please sign up. A serial killer is at large in New York City. Bodies of beautiful young women are being found in mausoleums and underground tombs. They have been stabbed int he heart, dressed in a white gown and holding a rose. FBI Agent Craig Frasier is leading the investigation. Kieran Finnegan, a psychologist, and Frasier's girlfriend are working together. When older bodies are found, they discover that whoever the killer is .. he's been doing this for years. And when an actress is found in a catacomb close to where Kieran works he fears for her safety. All the victims have one thing in common .. they are all beautiful ... and perfect. Their killer is obsessed with female perfection ... and Kieran has caught his eye. Heather Graham is fantastic when it comes to Romantic Suspense. The suspense starts on page 1 and ratchets up, up, up until the surprising and violent ending. I love how the characters interact with each other. Kiernan has 2 brothers, one of whom is her twin. They are very close and will safeguard their family with whatever it takes. Craig is an only child and although he understands that family is important, there are times he looks at them all and can only imagine what it would be like to have siblings. Kieran and Craig met in Book 1 of this series .... FLAWLESS. Although the second book, A PERFECT OBSESSION does very well as a stand alone. No spoilers in Book 2. Many thanks to the author / Harlequin (US & Canada) / Netgalley for the digital copy. Opinions expressed here are unbiased and entirely my own. I received the book from the publisher and NetGalley in exchange for an honest review. The body of a beautiful young woman has been found in a catacomb under a church (now nightclub)by a researcher/scientist and his interns. The woman turns out to be a model who has been missing for 2 weeks. Craig Fraiser, an FBI agent has been called in to investigate the case. Kieran Finnegan is his girlfriend and a criminal psychologist who has been asked to consult on the case. This is not the first time they I received the book from the publisher and NetGalley in exchange for an honest review. The body of a beautiful young woman has been found in a catacomb under a church (now nightclub)by a researcher/scientist and his interns. The woman turns out to be a model who has been missing for 2 weeks. Craig Fraiser, an FBI agent has been called in to investigate the case. Kieran Finnegan is his girlfriend and a criminal psychologist who has been asked to consult on the case. This is not the first time they have worked together, but this time Craig is scared since beautiful women are being murdered and Kierean is beautiful. When Kierean is not working as a psychologist she works at the pub she shares with her brothers. As it happens, The Church where the the missing model's body was found, is located directly behind the Finnegan's Pub. As the investigation progresses it becomes clear that there are more victims and that the killer is close at hand. It is also learned that a member of the Finnegan family has a connection with one of the victims. Could he be a suspect? I liked this book. I did not love it. I know I would have liked this book more if there were 1. The killers point of view. I think that would have been nice to have. Knowing what the killer was thinking, how he got his victims, motivation, thoughts on police investigation etc. 2. More clues about the identity of the killer. I like to be an arm chair detective and figure things out. These two things would have made this book so much better for me. There is romance (Craig/Kieran) in this book. We also get to see Kieran's relationship with her brothers as well. I didn't feel connected to any of the characters. None of them made me feel for them. This book is the second in the series but it does work as a stand alone book. But I wonder if I had read the first in the series would I have cared more about the characters? Nothing really wowed me or stood out for me in this book. It's like Heather Graham's murder mystery for really, really, ridiculously good looking people. You know, I don't even think she writes them anymore. There's either a roomful of monkey ghostwriters churning them out or more likely a computer program loaded with cliches, stereotypes and a well worn template. Killer is obvious almost from the start. The only surprise here is that I actually finished it. I don't think I realized exactly what this one was when I requested it. Instead of a stand alone type series like her Krewe of Hunters books this is more of a continuing series featuring an Irish pub owner/psychologist and her family and an FBI agent. However while Kieran and Craig as well as the rest of the Finnegan family are actually introduced in the first book - Flawless - I didn't feel like I had come in mid-story. It read very well as a stand alone. I liked the mystery quite a bit. It's go I don't think I realized exactly what this one was when I requested it. Instead of a stand alone type series like her Krewe of Hunters books this is more of a continuing series featuring an Irish pub owner/psychologist and her family and an FBI agent. However while Kieran and Craig as well as the rest of the Finnegan family are actually introduced in the first book - Flawless - I didn't feel like I had come in mid-story. It read very well as a stand alone. I liked the mystery quite a bit. It's got a bit of a Criminal Minds feel with a seriously twisted killer scattering super staged corpses around and a mix of the FBI and the psychology of it all. I had a few suspicions on the killer but was surprised by how the reveal came about. I really love seeing the investigation from inside the FBI with the discussion of suspects and compiling the information gathered from interviews. I feel like I'm right there with them standing around the board debating theories. The setting is fantastic as well. While a New York setting is always great I especially enjoyed the below ground historical look. It's interesting to think just how old New York is and what could be buried below all the newer buildings. I also enjoyed the relationship between Kieran and her brothers as well as the atmosphere in Finnegan's itself. I did have some issues with this book however. I felt like Kieran's role was a bit ambiguous with the group she works with. She's a psychologist not a psychiatrist like the rest of the doctors yet she's still educated and highly qualified. However, at times they treat her very much as a lackey using her to drop off files at the FBI or to take notes for them. As well, while the characters were all interesting, they all felt a little flat at times and I never felt like I was fully pulled into the book. There is never any doubt, when it comes to Heather Graham, that I will grab her book without hesitation. Even a bad book by Heather Graham is a good book and I would definitely recommend A Perfect Obsession. Kieran Finnegan, a psychologist, also works at the family pub and shares a bed with her FBI guy, Craig Frasier. He knows to keep tabs on her because trouble seems to find her…or does she find it? A model/actress was murdered just around the corner from Finnegan’s, but nobody thought it was con There is never any doubt, when it comes to Heather Graham, that I will grab her book without hesitation. Even a bad book by Heather Graham is a good book and I would definitely recommend A Perfect Obsession. A model/actress was murdered just around the corner from Finnegan’s, but nobody thought it was connected to the family…until her brother, Kevin, told her his secret. It’s easy to figure out that Kieran is Irish. She has three brothers. They are quick to defend and protect her, since she’s prone to finding trouble to get into. I’m not sure what’s going on, but I’m just not getting into this like I do most of her work. Am I having an off day? Or is it because it’s an ARC and will be tidied up before publishing. I think it will get better. You’ll need to check out A Perfect Obsession to figure it out for yourself. I feel on edge. I keep thinking…waiting…for “the moment”…when the monster reaches out from under the bed and grabs me. Heather has created a sense of menace from the serial killer. I can’t put my finger on the villain. Have I met him? Uh Oh. I think I know who it is and we have a big problem. I started out having a hard time getting into the story. I don’t know why. It has all the elements I require for a thrilling read. I rarely give up on a book, and I sure wasn’t going to give up on a Heather Graham book. And it is worth sticking with. As usual, she leaves me wanting more and I can hardly wait to pick up another one of her stories. 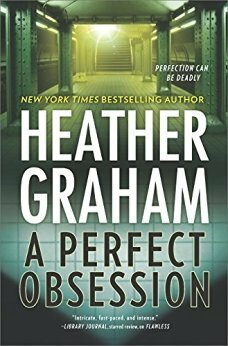 I voluntarily reviewed an ARC of A Perfect Obsession by Heather Graham. COMMENTS What I liked -- the NY setting and all the historical aspects of the city re cemeteries and the underground. What I did not -- the narrator … UGH just not my cuppa. The characters and plot were OK. Someone is killing beautiful young women and trying to preserve their beauty. Be warned, anyone who gave this book a 5 star review must be related to the author. 2 stars, 2.5 at best. The protagonist is a profiler involved in a case, her FBI boyfriend is investigating, her brother is a suspect, girls go missing from her family's bar, no one outside of bar customers are suspected. The readers know who the murderer is while the main characters don't have a clue. Only mystery here is why I finished this book. I expected this book to be better. The story was very slow and frankly disappointing. Some of the different characters in the book go on rants about history in New York City. I found this to be very boring and not necessary to the story. Wouldn't recommend, there are better mystery novels out there. As more women are murdered, their bodies discovered in underground locations in New York, it's clear that the police and the FBI are dealing with a serial killer. Craig and Kieran are desperate to track down the murderer, a man obsessed with female perfection. Obsessed enough to want to "preserve" that beauty by destroying the women who embody it. More like 3.5 stars. An excellent mystery, although I did find myself wanting to throttle Kieran on more than one occasion for being so predictably hard headed. Oh this was good. This lady always does her historical research and does it well. Really enjoyed the details of old New York and what is hidden beneath her streets. Creepy! The murder/mystery was very well done. Yep, a good one. I hope there are more stories to come about the lovely little Irish pub and the owners, those irrepressible Finnegans! I got this book as an advanced reader's copy with the understanding that I would read it and review it. I wish I liked this book better than I did, but unfortunately, I was not satisfied with this one. While the premise is interesting, and the history behind graveyards and burials in NYC was the highlight of the story, the characters were pretty flat and the dialogue was stilted and unbelievable. Also, the main romantic theme of the book was rather nonexistent, primarily because this story build I got this book as an advanced reader's copy with the understanding that I would read it and review it. This is a nice but not outstanding story from Heather Graham. In fact it is more a crime story than a romantic suspense, since there is no romance part. Kieran and Craig are already a couple, they probably had their story in the previous book which I actually didn't read. It's a pity that the author didn't use the opportunity to develop their relationship in any way like Nora Roberts does with her Eve and Roarke. This way it's much harder to attach to the characters. Although, I like the whole F This is a nice but not outstanding story from Heather Graham. In fact it is more a crime story than a romantic suspense, since there is no romance part. Kieran and Craig are already a couple, they probably had their story in the previous book which I actually didn't read. It's a pity that the author didn't use the opportunity to develop their relationship in any way like Nora Roberts does with her Eve and Roarke. This way it's much harder to attach to the characters. Although, I like the whole Finnegan's family, I wish there is a book for every member. I much preferred the first book in the series. This review is for the audiobook. The narrator was outstanding, the book not so much. I got bored in the middle and almost didn't finish it. It could have been about 2 hours shorter. The relationship between Kieran and Craig is kind of boring. Doubt if I will try another in this series. Being a fan of Heather Graham's work, I get a little giddy when I open her books on my Kindle. The rush to start another action filled story is always there. A Perfect Obsession is filled with eerie and creepy imagery from the underground tombs of New York, taking the thriller to another level of danger, while the chills were running down my spine. The suspense in the story is well built and the tension is escalating as more victims are discovered and the Finnegan family is once again right in t Being a fan of Heather Graham's work, I get a little giddy when I open her books on my Kindle. The rush to start another action filled story is always there. A Perfect Obsession is filled with eerie and creepy imagery from the underground tombs of New York, taking the thriller to another level of danger, while the chills were running down my spine. The suspense in the story is well built and the tension is escalating as more victims are discovered and the Finnegan family is once again right in the middle of it. The constantly present fear and danger, and the acute awareness that Kieran Finnegan is a match to the victims put Special Agent Craig Frasier on the edge, his overprotective tendencies heighten to the extream. The story is heavily ridden with the history of New York, and especially the history of different graveyards, going into such details that it dulled some of the building intensity from the investigation. Craig Frasier and Kieran Finnegan met and fell in love in the book one of the series. I enjoy the chemistry between them, the passion and banter between them are entertaining and fun. The relationship is a strong part of the story yet there's no further development or deepening of the bond or commitment between Kieran and Craig as the story progress. The link the Finnegan siblings have with each other is admirable, I love how their protectiveness of each other often gets them in more trouble than not. It tells a lot about Craig's nature, that they have accepted him as part of the fold so unconditionally, the respect Kieran's brothers have for is obvious. The second book in this new series is chilling and well written. Ms. Graham is an author I automatically buy and read. Her suspense ones are well thought out with disturbing killers. The books are not written from the killer's point of view so it helps to keep it from becoming too creepy. In this one, we meet Special Agent Craig Fraiser again. He appeared in the first book as did his girlfriend, Kieran Finnegan. I like Kieran even though she works for shrinks and is one. These two are pulled into The second book in this new series is chilling and well written. Ms. Graham is an author I automatically buy and read. Her suspense ones are well thought out with disturbing killers. The books are not written from the killer's point of view so it helps to keep it from becoming too creepy. In this one, we meet Special Agent Craig Fraiser again. He appeared in the first book as did his girlfriend, Kieran Finnegan. I like Kieran even though she works for shrinks and is one. These two are pulled into a disturbing case as a famous model is killed in a nightclub right by her family's bar. As more information comes out, Kieran finds herself torn between two different men - her lover and her brother. This conflict ads to the suspense. I liked how the reader is given a little bit of information and is in the same boat as Kieran and Craig, racing to try and figure out the killer's identity. It is more fun for me to try and figure things out with only a little bit of information. The twists and turns are nicely done. The red herring was also well done in this mystery. This story moved along quickly and kept my attention as each new clue and murder victim appeared. Ms. Graham does an excellent job of showing. This story played like a full length feature film in my mind. The scenes were vividly described. The interactions between the characters made it feel like I was in the same room as them. Ms. Graham is a talented writer who pens an excellent romantic suspense. This book is recommended to readers who enjoy a complex plot with great character development. I'll admit to being a little reluctant to read A Perfect Obsession because I was a bit underwhelmed by the first book in the series, Flawless. I felt like the author was kind of phoning it in with that one. I ended up being pleasantly surprised at how much this second book hooked me in and made me want to keep reading. The book once again features Keiran and Craig. They met in the first book and now they are a couple. Because of their jobs, they both end up working on the case of a potential ser I'll admit to being a little reluctant to read A Perfect Obsession because I was a bit underwhelmed by the first book in the series, Flawless. I felt like the author was kind of phoning it in with that one. I ended up being pleasantly surprised at how much this second book hooked me in and made me want to keep reading. The book once again features Keiran and Craig. They met in the first book and now they are a couple. Because of their jobs, they both end up working on the case of a potential serial killer in the area. When the body of Jeannette Gilbert is found in a recently discovered crypt under an old church, Kieran Finnegan finds herself unexpectedly drawn into the investigation. Kierans’ family owns the Finnegan’s pub which is located directly behind the church turned nightclub. What she doesn’t realize at first is that her twin brother Kevin is Jeannette’s “mystery lover”. Meanwhile, her boyfriend Special Agent Craig Frasier of the FBI is assigned to the case, and Kieran and her employers are called in When the body of Jeannette Gilbert is found in a recently discovered crypt under an old church, Kieran Finnegan finds herself unexpectedly drawn into the investigation. Kierans’ family owns the Finnegan’s pub which is located directly behind the church turned nightclub. What she doesn’t realize at first is that her twin brother Kevin is Jeannette’s “mystery lover”. Meanwhile, her boyfriend Special Agent Craig Frasier of the FBI is assigned to the case, and Kieran and her employers are called in to help with the profile of the killer. As the publicity heats up and another girl goes missing, the pressure to find the perpetrator intensifies. Will Kieran and Craig be able to find him before he has a chance to strike again, or will Kieran become his next victim? This is a very intriguing story with some clever twists thrown in to keep you guessing. It reads in a way that is more similar to a cozy mystery than an intense thriller, but there is danger and some psychological thrills given that Kieran is a forensic psychologist. I found Kieran to be a lovely character with a well-developed personality. Likewise, her boyfriend Craig, though he’s just a bit too protective sometimes. There is a nice interplay between Kieran and her brothers, and several interesting secondary characters. I was still guessing almost till the end as to who the killer was, so in that respect the mystery is well presented. This is the 2nd book in a 3 book series and I have not read the first one, but I didn’t feel like that detracted from my enjoyment of this story. Overall, I found this book to be an enjoyable read with a good story and characters. I really like Heather's books. Besides the suspense, she does a good job with the history of whever she is writing about. Her characters are very likeable and she keeps the suspense going right to the last chapter. Not my favorite, I kind of figured out who the bad guy was pretty early in. I prefer the Krewe Of Hunters series a little more although I do like the characters. A Perfect Obsession kept me involved and guessing almost until the end the book. Graham knows how to start with a bang and maintain the suspense; her pacing is excellent and her storytelling compelling. The main characters, Kieran and Craig, are engaging and make a good investigative partnership, even if Craig would prefer keep Kieran out of his cases. The plot, while not exactly original, offers more than enough suspects and an appropriately frustrating lack of useful clues to keep me 3.5 stars. A Perfect Obsession kept me involved and guessing almost until the end the book. Graham knows how to start with a bang and maintain the suspense; her pacing is excellent and her storytelling compelling. The main characters, Kieran and Craig, are engaging and make a good investigative partnership, even if Craig would prefer keep Kieran out of his cases. The plot, while not exactly original, offers more than enough suspects and an appropriately frustrating lack of useful clues to keep me unsure of the murderer until a scene or two before the reveal—and I wasn’t absolutely certain until the reveal. Nonetheless, as with Flawless, I liked but didn’t love this novel. At least this time, I know why. First, I’m squeamish when it comes to books about serial killers, especially if the book goes deeply into their psychology or gets inside their head. It’s surprising that I like Heather Graham’s books so well, particularly the Krewe of Hunters series, since they often do involve serial killers. But Graham doesn’t always go into depth regarding their twisted psychology; she tends to focus more on the “solve the mystery, find the killer, protect the innocent” angle, which is easier for me to deal with. A Perfect Obsession digs a little deeper into the psychology, partly because Kieran, the female protagonist, is a forensic psychologist, a profiler. Figuring out the killer’s motivation is her job, so naturally it’s going to get a fair bit of page time. There were a few times I had to mentally step back, distance myself from the story and the characters to keep from getting too creeped out. That’s a personal thing, so obviously, if reading about serial killers isn’t an issue for you, it won’t affect your enjoyment of the book at all. Second, while I really enjoyed the chance to see Kieran and Craig again, I was also a little disappointed. Craig is the perfect FBI agent and boyfriend, but he doesn’t get much character development this time around. I didn’t feel like I knew him any better at the end than I did at the beginning, and he leans ever so slightly toward being a stock character instead of a well-rounded, complex human being. Kieran is more complex, at least in this novel, and she gets a little more character development. She is also a bit more sensible than she was in Flawless, but early on, she pulls another of those let’s-keep-a-secret-even-though-it’s-important-to-the-investigation things that had me rolling my eyes and heaving exasperated sighs. Seriously, Kieran? You didn’t learn from the last escapade that it’s not a good idea to hide things from the FBI, and an even worse idea when the FBI guy is your lover? To be fair, Kieran is keeping someone else’s confidence, not hiding something she did. And she does persuade that person to come forward before too much time has passed. . . but it still bothered me. I’ll give her a pass this time, but I hope she doesn’t keep pulling this stuff. I have a problem with secrets; they don’t belong in an investigation or in a relationship. The third thing that bothered me is stylistic: the dreaded infodump. Heather Graham researches before she writes—that’s good; that’s necessary; it’s an important part of creating a believable setting and even getting the plot to work. But in A Perfect Obsession, she dumps a lot of that information in large chunks of dialogue, resulting in one character (not always the same character) giving lectures to another—in this case, a whole slew of history lectures and tour guide talks—that are clearly intended to inform the reader as well as the other character. I know it’s not always easy to find ways to convey information that’s important to the plot, but A) some of this information was more window-dressing than critical, and could easily have been pared down, and B) it almost always sounded like someone is parroting a history book or travel guide, which is just. . . clunky. Would I read another in this series? Yes, absolutely. Complaints aside, it was an entertaining and at times gripping story. And I like Kieran and Craig, and Kieran’s brothers; I look forward to more adventures with them. Not realistic, too predictable, too many characters/suspects, lame climactic scene towards end. Waste of time. I found myself drifting more often than not throughout this story. It has too much romance for my taste and it derailed the crime thriller part. I prefer her series with the ghosts. This review has been hidden because it contains spoilers. To view it, click here. I'd give this a C- in overall storytelling, suspense, drama, spark and creativity. I think I was overly optimistic about what this author could bring to a story based solely on the New York best selling author title and some of the review blurbs. There were some things I liked. I like the family connection and generally like the main characters. I like that there are little hints of things that get brought back up later. The book is easy to read but there are so many things missing. What follows I'd give this a C- in overall storytelling, suspense, drama, spark and creativity. I think I was overly optimistic about what this author could bring to a story based solely on the New York best selling author title and some of the review blurbs. There were some things I liked. I like the family connection and generally like the main characters. I like that there are little hints of things that get brought back up later. The book is easy to read but there are so many things missing. What follows is just random questions or things that irked me. Heather Graham is a prolific writer. That is without question. And she has an incredible talent for plotting compelling stories that are filled with twists and turns and romance and suspense and all the things that go into great storytelling. A Perfect Obsession is yet another example of her incredible abilities. In this story pub owner and forensic psychologist Kieran Finnegan consults with FBI Special Agent Craig Fraser to investigate a series of murders perpetrated by a serial killer who is o Heather Graham is a prolific writer. That is without question. And she has an incredible talent for plotting compelling stories that are filled with twists and turns and romance and suspense and all the things that go into great storytelling. A Perfect Obsession is yet another example of her incredible abilities. In this story pub owner and forensic psychologist Kieran Finnegan consults with FBI Special Agent Craig Fraser to investigate a series of murders perpetrated by a serial killer who is obsessed with beauty. His victims are beautiful young women and he displays them as if they are works of art. Which to him, they are. The characters in this story are wonderful, the villain as bad as villains get, the plot convoluted, and the writing spot on. I don't know how she does it, but Heather Graham seems to turn out almost perfect thrillers and A Perfect Obsession is another in her long list of excellent stories. Could not put it down. Highly recommended. I liked the first in this series..but this one just seemed almost juvenile in character development, dialogue and plot. A character's girlfriend is murdered and he seems almost completely devoid of feeling or even curiosity about the murder and murderer. The two main characters don't seem intelligent enough to excel at their jobs...and everything is just too neat at the end. Uck! Main characters were sappy. Left a bad taste in my mouth.